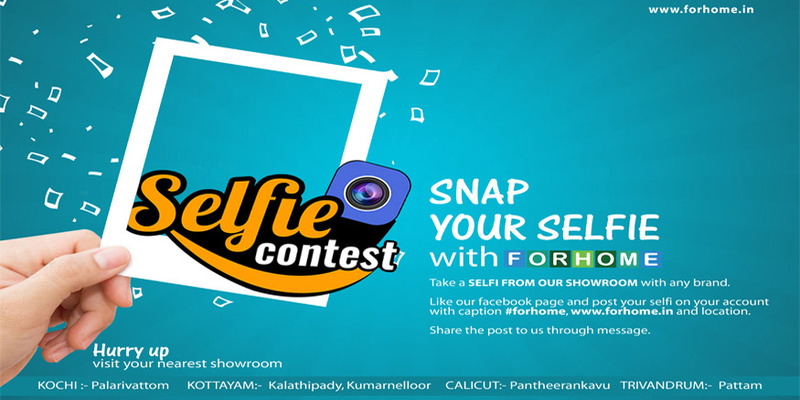 Here’s one more reason to make sure you are with us at Forhome next week: a selfie contest with a fabulous prize! During your Forhome shopping, we ask all our customers to take selfies from our showroom with any brand and share it via facebook. Visit your nearest Forhome showroom. Take a selfie from the showroom with any brand. Post your selfie on YOUR Facebook with caption #Forhome ,#www.forhome.in with Location (this one is important). Share the post to us through facebook message. We will post your selfie in our page. Those who gets more likes and share will win the prize! We want to keep the contest fair and transparent, the same way, as Forhome conditions. So you will decide the winner! Yes, the destiny of all the prizes is in your hands: the selfie that gets the most likes and shares on Facebook will get the prize. Weekly Winners - A winner will be selected at the end of every week and featured on Forhome’s facebook page and receive a electric cooker as the weekly prize. Bumper prize winner - From the 20 entries with the highest number of like and share, we will choose one winner through lucky draw who will win a chimney. Upload your selfie and stand a chance to win incredible prizes!